Organisers: Clodagh Brook, Florian Mussgnug, Giuliana Pieri, Emanuela Patti. 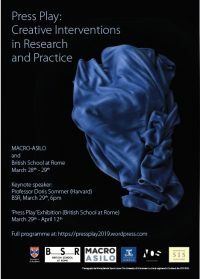 This conference explores interartistic and intermedial encounters in Italy and the new kinds of experimentation that arise from these. It will focus attention on individuals and groups who are actively engaged in creative boundary-crossing and on institutions who fostered or hindered interartistic and intermedial exchange. It may subvert widely accepted canons as what looks central under the lens of the monodisciplinary microscope may not be so from an interartistic one. We welcome proposals from established scholars, early career researchers, and PhD students from all disciplines. 1. Interartistic and intermedial, experimentation and creativity. How does intermedial and interartistic practice work to enhance creativity? What are its links with experimentation? Why does it arise? How does looking at artists and artworks from an intermedial/interartistic perspective reshape the map of what is central and what is peripheral? Which artists have been lost to cultural histories because their work falls into the interstices between the arts? How has working between two or more arts has been received or marginalised across the ages? What is instrumental in this change? Why does this take place? What kind of interartistic practice is taking place in medieval Italy, in the Renaissance or later? Are there particular periods in Italy’s history in which explosions of interartistic practice take place and why? How are borders between the arts policed and why? How have institutions in Italy played a part in shaping what fits, or does not, in certain artistic tradition? How do we best investigate the process of dialogue/translation/remediation involved in border crossings between the arts? How might interartistic and intermedial practice bring artists together? Why do groups come together and how? How does the collaborative making of artworks across boundaries differ from solitary practice? How might transmedia practice – and the fandom associated with it – make us think differently about readers and about artistic and literary communities? How has thinking in Italy contributed to the international debate on intermediality and on interartistic practice? How does intermedial and interartistic practice threaten the stability of artistic forms and disciplines? Are there negative implications to be considered? What are the risks and dangers of intermedia? The main goal of this conference is to look at Italian culture from an intermedial perspective (rather than a multimedial, or multiartistic one) to understand how the bringing together of two or more art forms, or two or more artists working across art forms have changed creative production in Italy, and indeed beyond, from the medieval age to the present. We plan to publish selected papers from the conference in an edited volume. Please send abstracts of maximum 250 words (individual papers and posters) or 500 words (panels, workshops and roundtables), together with a short academic biography (max 150 words) to us at: brookc@tcd.ie by 30 January 2019.